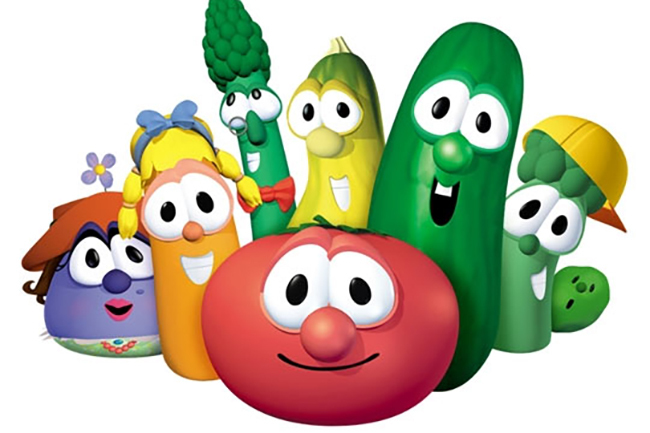 It may come as a shock to anyone who’s ever explored the Christian subculture of America, but at one time, there really never, ever, ever, ever, ever was a show like VeggieTales. That time was before December 21, 1993, the day when “Where’s God When I’m S-Scared?” first appeared on VHS in Christian bookstores. On that day, not even VeggieTales’ creator Phil Vischer could imagine how the series would go on to impact kids and families for the next quarter of a century. With the 25-year anniversary of VeggieTales happening this month, here are 25 interesting things you may not have known about the show that redefined a genre and impacted millions of Christians. The kitchen counter where VeggieTales takes place could easily have resembled the fictional world of Candy Land. When creating his lead character, Vischer began by experimenting with a talking candy bar. His wife, however, told him moms would be mad if the show caused kids to fall in love with candy. He moved on to a cucumber, and the show forever took a more health-conscious turn. Vischer wasn’t necessarily partial to vegetables. He simply needed character models that were easy to animate in the early days of computer-generated graphics. Since tomatoes and gourds didn’t require animating arms, legs, or hair like human or animal characters would, the show waltzed into the produce aisle. Vischer’s two heroes growing up were Walt Disney and Jim Henson. Their influence in storytelling, humor, and creativity can be seen throughout the series. Vischer temporarily surpassed his heroes in at least one way. In his autobiography, Vischer says his company Big Idea was at one time the largest animation studio between the coasts—overshadowing Disney, Pixar, and DreamWorks. According to Vischer, VeggieTales became the most successful direct-to-video series in history. Between 1996 and 1999, Big Idea grew revenue by 3,300% from $1.3 million to $44 million. But as you’ll learn further down, that success would later end with the company in bankruptcy. Many VeggieTales DVDs had secret Easter Eggs hidden around various menu icons—including one where the French Peas attempt to make a bootleg copy of the show’s first feature movie, Jonah: A VeggieTales Movie. Here’s a list of some of the hidden features you missed. Now you want to break out those old DVDs, don’t you? VeggieTales released in 1993, the same year as Jurassic Park and when production began on the first Toy Story film. Both of the latter movies played an important role in introducing audiences to the capabilities of computer animation. In a world where Christian media is usually criticized for being behind the times, VeggieTales was ahead of its day in exploring new technology for kids’ programing. VeggiesTales is commonly described a show where vegetables tell Bible stories to kids. But in actuality, only a small percentage of the videos consisted of retold Bible stories. Instead, the overwhelming majority of shows involved spoofs of popular literary tales or well-known pop culture stories such as Indiana Jones (“Minnesota Cuke”) or Lord of the Rings (“Lord of the Beans”). Each episode did introduce kids to a Bible verse that supported the episode’s theme. Of the VeggieTales shows that featured actual stories from Scripture, the canonical representation skewed heavily in favor of the Old Testament. The breakdown goes: Genesis (featured in three videos); Exodus (2); Joshua (1); Judges (1); Esther (1); 1 Samuel (1); Daniel (2); Jonah (1); Luke (1). Vischer’s mom, who has a Ph.D. in Christian Education, gave him some initial rules about creating VeggieTales. They included: 1) You will not portray Jesus as a vegetable, and 2) try not to imply that vegetables can have redemptive relationships with God. The first rule is why there are almost no VeggieTales episodes focused on New Testament stories. VeggieTales’ legacy includes almost 50 direct-to-home videos and two full-length feature films, but in 2015, the brand moved to Netflix. The streaming giant has since created two original series based on the characters. No plans for future direct-to-home VeggieTales videos have been announced. If this really marks the end for the series’ traditional means of distribution, 25 years makes for a very generous expiration date for vegetables on VHS and DVD. Predating the move to Netflix, the veggies found themselves in hot water for a number of reasons that included a poor growth strategy, draining cash flow, heavy debt, hefty legal fees, and a lost lawsuit. In September 2003, the company filed for bankruptcy and was sold to Classic Media LLC, the same company that owns Lassie, Rocky & Bullwinkle, and Casper the Friendly Ghost. After the bankruptcy sale, Classic Media, a secular company, made a deal with NBC to bring VeggieTales cartoons into their Saturday morning lineup. It can be argued that VeggieTales episodes were driven more by biblical values than they were by actual biblical stories. Vischer lamented this in an interview. “When I lost VeggieTales and Big Idea, one of my first responses when my head finally stopped spinning, was, ‘Wait a minute, did I just spend 10 years persuading kids to behave Christianly without teaching them Christianity?” he said. After leaving Big Idea, Vischer created Buck Denver Asks, “What’s In the Bible?”—a 13-episode program to lead kids through the Bible’s grand narrative from Genesis to Revelation. The program uses puppets, animation, songs, and voice acting—skills that were perfected during Vischer’s time working on VeggieTales. In his new series, Vischer was finally able to explore New Testament stories that were unavailable for VeggieTales because of his promise to his mom to not depict the Messiah as a vegetable. Qwerty, the animated computer who introduced kids to featured Bible verses, got his name from the first six letters on a standard computer keyboard. His first design was based on an IBM 386. In 2010, Qwerty upgraded to an Apple iMac with a voice chip and webcam. Who keeps a desktop computer on their kitchen counter anyway? Mr. Lunt, the eyeless, mustached character with a strange love for cheeseburgers, is often mistaken as an onion by fans of the show. Vischer has gone on record, however, identifying the wisecracking series antagonist as a decorative gourd. Andrew Peterson, whose song “Is He Worthy?” became a favorite in church services this past Easter, wrote some of the Silly Songs for VeggieTales with his friend Randall Goodgame. A favorite is the Silly Song “Monkey” which helps Bob learn the difference between monkeys and apes—well, kind of. Vischer voiced almost half of the VeggieTales characters including Bob the Tomato, Archibald Asparagus, Mr. Lunt, Pa Grape, Jimmy Gourd, Mr. Nezzer, and Phillipe Pea. Vischer calls Bob his “inner Mr. Rogers” but says Archibald is most like his real personality. Before Larryboy, Vischer had planned to give Bob a superhero identity called Bat-Bob. Larry eventually donned the cowl and became a fan favorite—spawning a line of toys and video games based on the suction-cup-wearing hero. 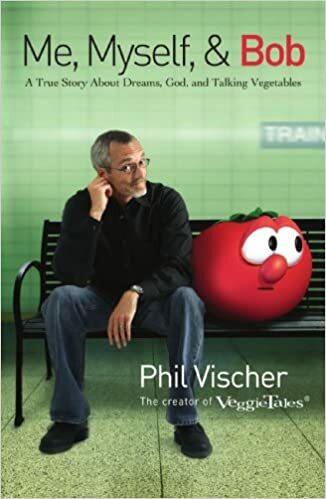 In his autobiography, Vischer says if Veggietales had been a typical Christian show, Bob and Larry would have been called Tommy the Tomato and Kooky Cucumber. Vischer said he wasn’t aiming to make a typical show and wanted to avoid alliteration. He sought more common names for his main characters. Bob was named after Vischer’s stepdad, an electrician and—by Vischer’s estimate—a regular Joe. In a 1992 reel created to attract potential distributors—a clip called “VeggieTales Promo, Take 38”—Archibald Asparagus states that Bob and Larry want to make a Christian TV show. VeggieTales was actually released, however, as a home video series for most of its existence. It wasn’t until 2006—14 years after the initial promo was made—that an actual VeggieTales TV series was created, fulfilling Bob’s lifelong dream. The rise and fall of Big Idea caused Vischer to recognize that dreams—even dreams of ministry influence—can be a source of idolatry. And lastly, in perhaps the most disturbing event to ever happen in VeggieTales history, Larry’s hunger gets the best of him. In the first episode of the Netflix series, VeggieTales in the City, Larry is served a sandwich that contains, you guessed it, sliced tomatoes. Bob was unavailable for comment. In honor of VeggieTales’ 25-year anniversary, LifeWay stores are featuring all single title VeggieTales DVDs at $5 now through December 8. The $5 sale excludes CDs, double feature DVDs, and VeggieTales box sets.